← 6 Tabs Open and I Still Managed to Finish My Blog! Keep Your Distance…I’m trying to Learn! When I reflect on my educational experience as a facilitator of learning and as a student there are a number of different online tools that I have found very useful and relevant. In the realm of Regina Public Schools, every student and teacher has a Google account so we have access to all of the great programs Google has to offer. One of my favourite productivity tools has been Google Classroom. This tool is great for distance learning as well as in school. The nice aspect to Google Classroom is that it’s private! as the facilitator of the class, we have the ability to create assignments that grant us the ability to attach any supporting materials and rubrics that students may need to be successful. Google Classroom has created an online environment that helps students stay organized with their work. Having the ability to create documents, slides, and other such representations for learning and having them attached to the assignment created by the teacher also creates greater accountability for students within that class. The best aspect programs like this are that it would be perfect for distance-based learning. Some of our students have attendance issues and this is the perfect fit for students who are struggling to get to school, whatever the circumstances might be, and gives them a greater accessibility to the work and content that they would normally miss without it. Zoom rooms, online forums such as UR Courses, and blog sites have been a blessing for my personal educational journey, they gave me the ability to attend class from the comfort of my home. Scott put it best when he stated, “The flexibility that online courses provide is the #1 gamechanger for me. I love the freedom of being able to work at my own pace while not necessarily having to be in class for an entire evening.” Not only are these outlets efficient for gathering as a class online, but they are great for being able to give me the time I need to gather and formulate my thoughts and ideas in a less rushed and more reflective way. There are some barriers that are present in most schools when utilizing this productivity tool within the class. I talked about the socioeconomic background of different students in my previous blog post and how not every student will have access to technology outside of the school and we need to be sympathetic to their circumstances and make sure that there are alternative options for students. Students with greater needs within our classes may also have difficulty utilizing these types of tools and it is our responsibility to assist them and possibly create adaptations that harness success for them. If my class was converted into an online format I think I might enjoy my job a bit more. An online learning environment might cut down on some of the distractions that are present when there are 25 to 35 students in your classroom space, although there are different distractions when using online outlets. Students would not lose or misplace their work as it would be constantly connected to the assignments created by the facilitator. I would also bet that more assignments would be completed. In the Learning Theories and Online Learning article, it is brought to attention, in the connectivism section that, “…connectivism is really the first theoretical attempt to radically re-examine the implications for learning of the Internet and the explosion of new communications technologies.” Although many educators might be hesitant when it comes to incorporating online modules and resources for students, education is headed in a connectivism direction and we will soon see greater student engagement with these tools in practice in the future. Technology and Tools for Online Learning makes a great point about the globalization of technology stating, “…the educational benefits of these technologies may be easier to articulate due to their worldwide acceptance and use, and they can be integrated into existing curricula without major change or re-validation.” With access to these great tools, I would not be surprised if we start moving away from traditional teaching practices and start applying distance learning within our education systems. We have to remember that this shift would have some negative impacts as well. Lack of human connection and social aspects would put a strain on students and might make their lives less enjoyable. Elementary aged students love their recess, it’s a time for them to bond with classmates and friends, play sports together, even just to get outside for some fresh air. There is a human element that is really important in education and being a social being is one of the skills that students walk out of their educational experience with. 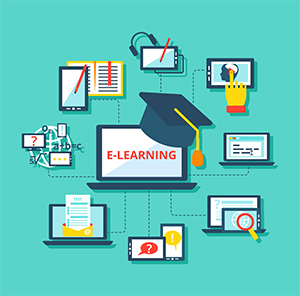 Overall, I think online tools for distance learning are only going to improve and create greater opportunities for online learning and communities. We see the impact Twitter has had and how discussions have occurred through it, minus the trolls. It is exciting to think that the many different tools at our disposal may have a greater impact on education in the future. I have had a great experience with them throughout my Master’s program and I hope they continue to grow throughout education. This entry was posted in EC&I 833 and tagged eci833, edchat, edtech, education. Bookmark the permalink. 3 Responses to Keep Your Distance…I’m trying to Learn! I agree with you regarding Google Classroom. While there are potentially some privacy concerns that I should be more aware of, I cannot deny that Classroom has made my life as a teacher much easier. Like you said, some students have attendance issues. Since I teach at Martin (which happens to be home to the Regina Public Schools’ “sports academy”, students are frequently absent for sometimes weeks at a time. Classroom allows those students to stay on top of their work while they’re away. If anything…it’s a program that is taking educators a step in the right direction!